What is it like to protest abortion and celebrate life in Washington DC at the annual March for Life? My seventeen-year-old son, Andrew, and I really didn’t know what to expect, but after reading an article about Orthodox people taking part in the march, we decided this was our year to find out. The day before the March, we drove to Washing DC from Atlanta. Why is this issue so important to us that we’d inconvenience ourselves so much? Statistically, ⅓ of the babies conceived since Roe V Wade passed have been aborted. It’s estimated that ⅓ of Andrew’s generation is missing--never born due to abortion. Shockingly, abortion is the leading cause of death worldwide with about 50-60 million babies aborted each year. Those facts are scary and upsetting, but our personal stories also motivated us to go to Washington. Like many of you, being pro-life is not just a political statement, it’s affected us personally. Choosing life, or in Andrew's case, having his mom choose life, has brought beauty and joy into difficult and painful circumstances. 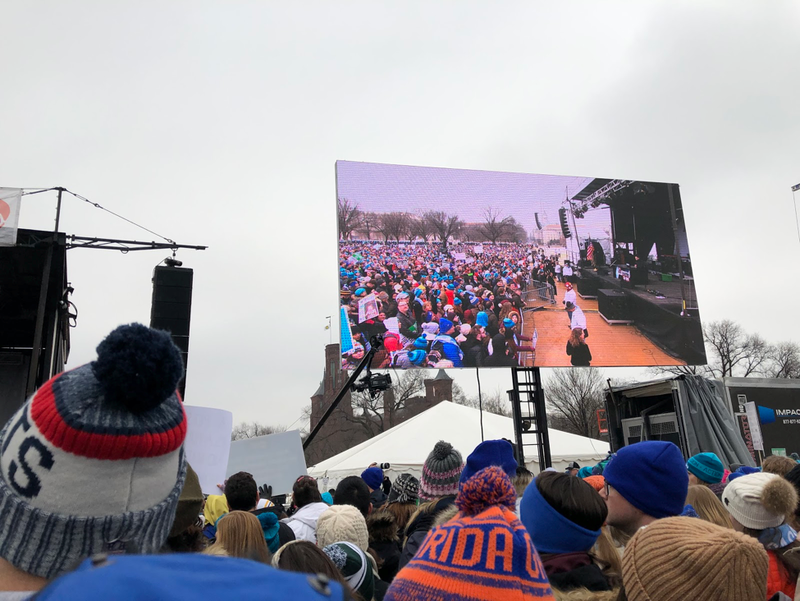 Marching for Life is a way of expressing hope, the love that can come from choosing to open your heart, and living out our faith that God has created each of us as precious in His sight. On the morning of the March, Andrew and I felt a little alone as we walked in the muddy slushy snow over to the site for the March. We were early and the crowd was thin. What if no one came? We were encouraged when we met a group of people from an organization called Save the Storks. They were giving out free hats and scarves, which we took. The hats said, “love.. compassion.. action” which seemed just right so we put them on. As we approached the main site, we could see a small crowd was rapidly growing. The first speaker, Ben Shapiro, soon began. He was broadcasting a show live from the March for Life (MFL). Vice President Pence, who later made a surprise appearance at the March, called in an interview. After Ben Shapiro finished, a Protestant Christian band, appropriately called the Sidewalk Prophets, played some songs while Andrew and I wandered off to find the Orthodox group. We hoped they’d be meeting on a certain corner based on a FB post I’d seen. We saw many other groups gathering, often in prayer. The crowds were rapidly becoming massive. There were large groups of mostly Catholic high school students. Some of them brought marching bands- which struck me as a little odd for the event, but I appreciated their enthusiasm. Seeing all the high school students was encouraging to Andrew. It made him feel less alone in his faith and convictions. Clearly, there are a lot of pro-life young people! 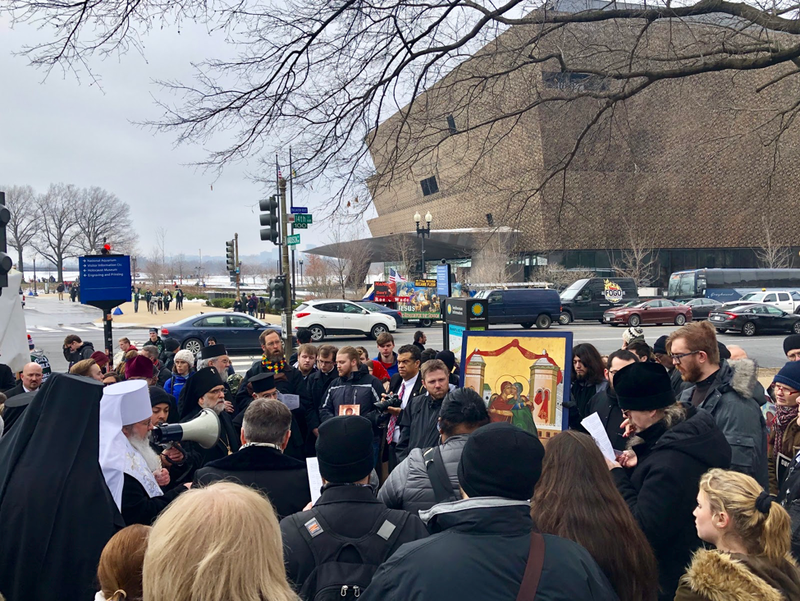 As we watched busloads of Catholics streaming into the Washington Mall, we were happy to find a group of seminarians from St. Vladimir’s and St. Tikhon’s along with other Orthodox clergy and laypeople. Orthodoxy is such a small world, Andrew and I ran into a few people we knew which touched our hearts and helped us feel part of the group. The MFL itself was delayed by about a half hour because the crowds were much larger than expected. As always, the march opens with a joint Catholic and Orthodox prayer. Praying with thousands of people in the streets of Washington was a beautiful experience. The March for Life must be stressful and painful for anyone who has been personally affected by abortion. Save the Storks had a banner which read, “abortion stops one beating heart and breaks another” which expresses this perfectly. Women who have had abortions along with anyone who has encouraged someone to have an abortion need grace and healing. The unique Orthodox service written for the MFL is a beautiful expression of God’s mercy, love, and compassion. Singing this service on the cold street corner brought tears to my eyes. Led by Metropolitan Tikhon, our Orthodox group had suddenly grown and the words of the hymns rang out, lifting our spirits. After the service, it was time to join the March. The March is so massive that different groups have somewhat different routes. We walked for a long time, maybe three or four hours. Everywhere I looked there was an endless sea of people. Crowds upon crowds on each street, all proclaiming the value of life. In the news, sometimes you see angry people who are anti-abortion. I don’t recall seeing anything like that at the MFL. There were a few graphic images on signs (which I glanced away from). The only kind of counter-protestors I saw were small groups who were yelling stuff about all Catholics going to hell for worshipping Mary. I wondered what motivated those folks, but the Catholic, as well as non-Catholic marchers, remained peaceful, joyful, and positive. Most of the signs people carried were compassionate and life-affirming, just like the MFL itself. There were many enthusiastic groups marching, but I thought our Orthodox group was the coolest --in our humble Orthodox style of cool. As we marched, we sang Orthodox hymns. Like many of our services, it felt both joyful and somber. I tried to stay near the chanters so I could listen. For me, the most touching moment was near the end of the MFL when the Orthodox chanters sang part of the Paschal Matins followed by Christ is Risen. Singing about Christ’s victory over death was triumphal and glorious. We all sang a bit more loudly and others around us became quiet, listening to the joyous words. The March for Life focuses on changing hearts, minds, and laws. All of those things are important, but this hymn, reminding us that Christ has conquered death, trumpets the truth that the hope we have in Him transcends our sins, legal injustices, and even the tragic deaths of the innocent. He has already triumphed, we simply need to do what is in front of us to do. Our Orthodox group closed with prayer and soon Andrew and I joined throngs of people leaving the city. Maybe next year, you will join us in Washington DC to protect the unborn. By marching, you can be a visible reminder to others that God loves each of us, no matter the circumstances of our conception. The MFL gives us a beautiful opportunity to come together and take a stand for the most vulnerable little people among us. Being part of the MLF is an uplifting and prayerful experience.